This is my third year losing my zucchini and summer squash plants to something. First two years lots of cucumber beetles. This year I used row covers when I planted and things seemed to be ok. Took off the covers and within a couple weeks things look bleak. Wilting - bacterial or other, don't see any beetles or svb. Cucumbers may be effected too. I garden organically, rotate crops, interplant radishes, flowers, etc. so perhaps taking a year off of curcubits will help. 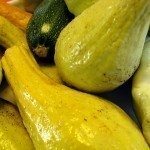 My two questions are this: can I plant anything after pulling up the squash plants that will a. grow and be ok; b. help the soil eliminate bacterial ick and be healthy for next year? It may be a good idea to have a soil test performed. This will give the real information as to what you soil may be lacking. You local county extension office office can help you with this. The you can go about adding or planting crops that would be happiest in those soil conditions. I also garden organically and like you, rotate crops. Sometimes there are just years where no matter what we do, mother nature doesn't cooperate. I understand your frustration! This can be a good time to seed and plant research to fine varieties that will perform better.